About 3 1/2 years ago, at the age of 69, I was fretting because I couldn't pick up my 13-pound granddaughter. I figured that in order to get her into my lap, I would have to wait until she could climb there! My police officer son, who keeps fit, strong, and happy with CrossFit, urged me to contact Coach Greg Glassman because he wanted a life-altering best for his mom. That contact and his unspoken confidence that I wasn't "too old" were some of my son's sweetest gifts to me, especially because the gift goes on and on every day! A couple of weeks later I walked into a world foreign to me. Actually, I paced up and down in front trying to figure out what I was getting myself into as I surreptitiously glanced in the window of a somewhat daunting Brazilian Jiu Jitsu center where Coach Glassman, in those early days, had a little rectangle of CrossFit floor space where he and Lauren worked their magic. I finally made it through the door after Coach noticed me loitering outside! On that day I developed a bond with the Gravitron (with lots of help) and could squat only with poor form, and only to the highest plyometric box. Sit-ups followed the squats, and by the time I had done five sit-ups, I knew that one of the components of my quads had given up... actually failed! My first workout was over! When I informed Coach that I couldn't do one more sit-up, there followed the only time in my now long acquaintance with him, that I found him speechless, if you can imagine that! Absolutely INSPIRING! Remember, Age is just a number you write on paper, it means absolutely nothing, you are making progress and while it might now be as fast as the young Cross-fitters at your local box, i garauntee its exponential to your age groups average! I'm sincerely humbled. If there was anything more inspiring, I could not think of it right now. Quality of life and the desire to improve oneself at an accelereted age is what keeps me motivated and moving forward. Its never too late as long as the Breathe is present. Thank you for your inspiration! 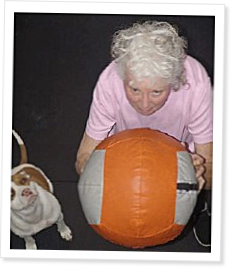 I am going to get my grandmother to do crossfit with me as well. Now I can show her and have proof that you are never too late to start anything. Sincerely from the bottom of my heart, thank you! A testament that whatever you put your mind into will alter the results of your expectations. Before starting CrossFit, about two years ago, I believed that my fitness level was fairly adequate for my age which was 67 yrs. I walked and used machines at a gym but noted how tired these and other activities left me feeling. After several falls and injuries, I worried where I was headed. I was quietly accepting the fact that I would never regain the strength, flexibility and endurance I experienced as a woman half my age. At one point my son, a CrossFit trainer and Jiu-Jitsu instructor, showed me a few core exercises including a Turkish get-up which was impossible for me to do. I thanked him and retreated into a funk for several days knowing I had to make a decision to help myself soon. Along comes CrossFit! Jessie, my son, did not discourage me when I suggested I start working out at his gym. Squats, sit-ups, push-ups, scaled burpees and light weights nearly did me in, I was afraid to continue but more afraid to quit knowing what the consequences were. I was not going down the "Give up" path! With his persistent encouragement and the support of others at the gym I kept going. Today I'm 40 plus pounds lighter and stronger than ever. I now do weighted Turkish get-ups. Completed a 4 mile Mud Run last year. Downhill skied for the first time in nearly 10 years feeling strong and confident. My plan is to continue CrossFit for as long as I can. For me, it's been a life changing experience that I wish for others in my age group. i wish for more contact with CrossFitters my age and even competitions that would encourage and challenge all of us! Thank you Jessie Carbone for having the courage to coach your mother who at times might expect not be your most compliant participant.